Welcome to Hamburg. 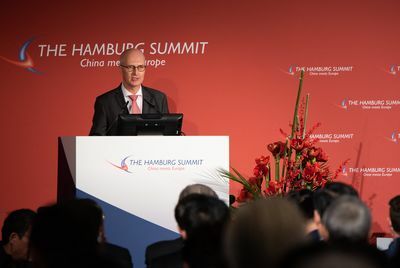 The "Hamburg Summit - China meets Europe" is of great importance to us in Germany and especially in Hamburg where we work with partners in China on a daily basis. For about 300 years Chinese products have come to Europe through our port. Hamburg is China's gateway to Europe, as well as Europe's gateway to China. More than half of all German-Chinese trade passes through the port of Hamburg. Especially now that we are beginning our work to expand the river Elbe, making it deeper and broader, we will be even better equipped to handle this traffic in future. Our port provides excellent railway connections to destinations in Germany, Southern and Eastern Europe and also to 27 cities in China. As the traditional hub between Europe and China over several centuries, we would like to be a strong partner in the Belt-and-Road strategy of the Chinese government. About 550 Chinese companies have settled in Hamburg and about 650 German companies are conducting their business in China from a Hamburg branch. A number of high level universities and research institutes with a focus on applied sciences make Hamburg a place of innovation full of young companies and startups. We are very pleased to be able to welcome Vice Prime Minister of the People's Republic of China, Liu He, tomorrow. His visit is a great honor for us and a sign of our good relationship to China. China's big cities are leading the way when it comes to reducing emissions and trying out sustainable mobility concepts. This is crucial, because the success of climate protection stands and falls with the global cities. What we do here, in an innovative metropolis like Hamburg or an even bigger city like Shanghai, can set an example for others. In this vein, Hamburg is looking forward to host the ITS World Congress for intelligent transport systems in 2021. For hundreds of years the economic success, the prosperity and the quality of life for the people in Hamburg, are based on free trade and good relationships to partners all over the world. So, we shall stay on this course. The "Hamburg Summit - China Meets Europe" plays an important role in our aim to meet the challenges of the future together. I wish you a great conference, many interesting conversations and promising new contacts. And, of course, a wonderful time in Hamburg.